Path, the iPhone-based social network from Facebook alum Dave Morin, comes to the iPad today with a brand new app designed to take special advantage of Apple’s larger-screened devices. The new Path offers iPad-specific features, like a landscape mode which provides a mosaic view of daily activity, and more detailed information about individual updates, and a map view providing a bird’s eye look at daily network comings and goings. When viewing Path on the iPad in standard portrait perspective, it looks and works a lot like its smaller-screen sibling, albeit with more emphasis on images, which work very well on the iPhone but even better on the iPad. But turning the iPad to landscape orientation reveals Path’s exciting new moments overview, which takes the most interesting posts of the past day from your network and lays them out as boxes of varying size, with larger ones representing things you’ll likely find more engaging. Path uses a special algorithm to determine what might be most interesting to any given user, and founder Morin told me in an interview that it should come up with a different layout every time you shift your iPad from portrait to landscape, meaning you’ll never see the same thing twice. Users can also access much more information at-a-glance on specific activity, thanks to additional screen space. 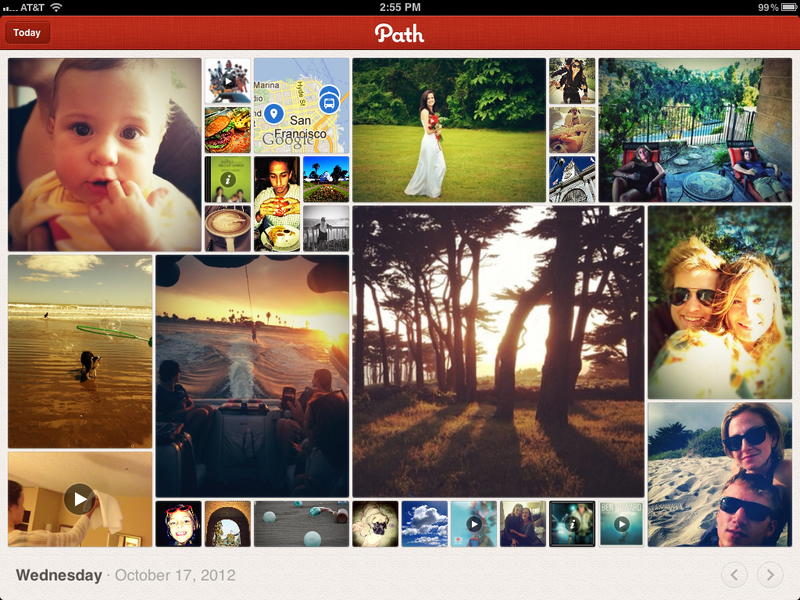 Path now provides a lot more insight into each update in a single, unified view. There’s also a new “reports” feature which lays out all of the location-based updates from a user’s network on a map, letting them see daily comings and goings of their friends all in a central location. Morin says it’s interesting to see the difference between his network’s daily activity during the week, which tends to concentrate in and around San Francisco, and during the weekend, which sees a lot of people coming and going via airport. As for why the iPad, and why now, Morin expressed a strong belief that Apple’s tablet represents the next stage of personal computing. In fact, he suggested the iPad is best thought of as the car to the PC’s horse-drawn carriage. In addition to being a key device to the future of computing, Morin also said that an iPad version will help get Path in front of new and different audiences, and noted that the company had always wanted to tackle an iPad-specific design. This version was designed by a team assembled expressly for the purpose of creating something tailored to iPad, separate from the iPhone product team, and he says that’s the approach Path will take going forward, with unique approaches to each different platform where Path appears. As for timing, Morin admitted that the iPad mini’s launch provided an optimal release window for Path’s iPad app, and said it really does shine on the iPad’s smaller screen. Asked about further development of partner plans along the line of Nike+ integration, Morin said that for now the team is actually more focused on “working with Apple and bringing new experiences like this to the iPad mini” and hasn’t been concentrating on that side of the business. He did reveal that this is only the first of “a bunch of cool stuff” still to come for Path, so we should expect to see more changes on the heels of the iPad app. Note: The app may take a while to propagate to the App Store, so keep checking if you’re not seeing it.